Aram I, Catholicos of the Great House of Cilicia. 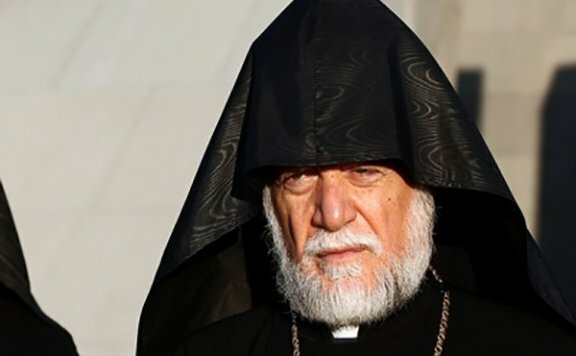 ANTELIAS(News.am) — All the communities of Syria, including the Christians, must take part in that country’s peace process, according to Catholicos Aram I.
Catholicos of the Great House of Cilicia, Aram I, noted the aforementioned at the meeting with UN Secretary General Nicolas Michel and UN and Arab League Envoy to Syria, Staffan de Mistura in Geneva Friday. During the two-hour consultations, the Catholicos listened to the viewpoints on Syrian crisis normalization, following which he presented his ideas on the peace process and specifically Christian communities’ participation. Firstly, Aram I stressed that as citizens with equal rights and responsibilities, the Christians must have an active role in Syria’s political life. Aram I made a number of practical proposals, especially regarding the participation of community representatives in the upcoming talks to be held Geneva. The attendees agreed with the Catholicos and suggested continuing the consultations with him in light of the upcoming talks. The last meeting Aram I participated in over the Syrian crisis took place last October.